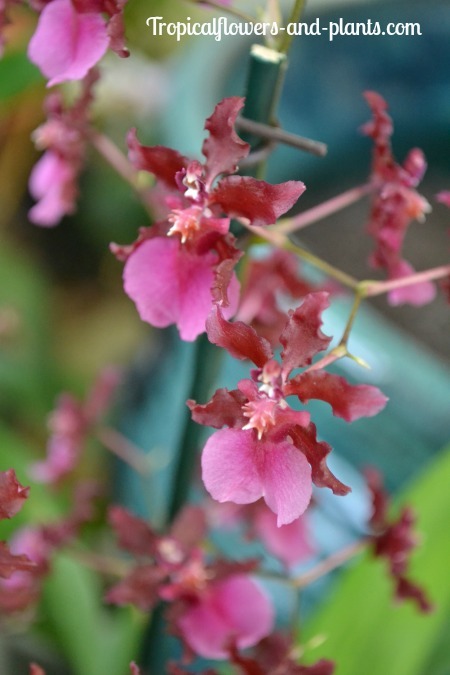 The Oncidium orchid has one of the smaller blooms amongst the orchid families. Those small blooms do not stop this orchid from making their presents! Each single stem will produce an abundance of eye catching blooms. The blooms tend to look like little dancing ladies, hence their nickname “Dancing ladies”. The lip of the flower in most Oncidium orchids is dominant and appears to be the ladies skirt swirling in the wind. While, the smaller petals act as the arms and head of the dancer. So..... next time you see this orchid see if you can spot the dancing lady! 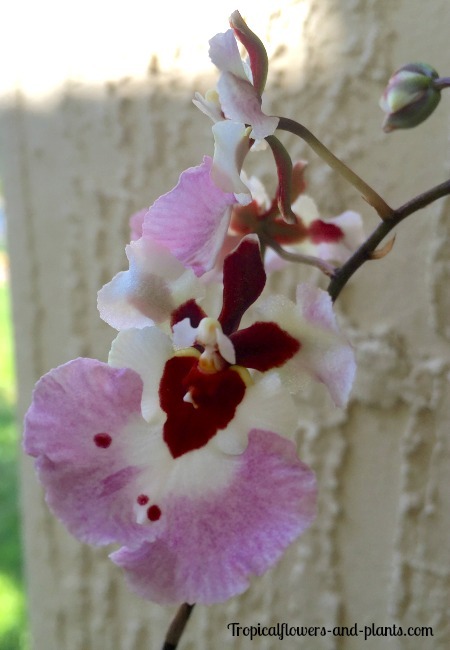 One of my favorite parts about the Oncidium orchid is that some species contain a pleasant sweet fragrance!!!! The particular orchid I have smells like chocolate. So when he is in full bloom my entrance tends to smells like Hoffman’s chocolate. Another great thing about this orchid group is that it is very diverse in the different locations it will thrive in. This is a general overview on how to care for your Oncidium orchids. There is a vast variety to pick from so before purchasing your orchid make sure to ask questions on that specific one. The needs may fluctuate slightly. I found both of these beautiful orchids at my local Home Depot for about $5. I couldn't pass that deal up!!!! 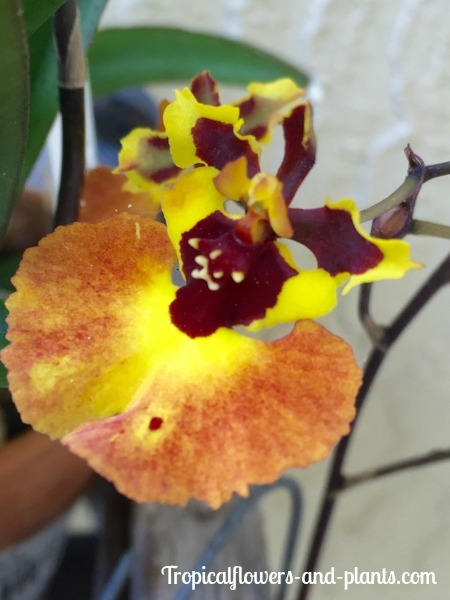 Oncidium orchids can receive anywhere from direct light (can tolerate several hours) to bright light throughout the day (under a patio enclosure), depends on the species and their growth state. When the orchid begins to bloom you may want to move the orchid to an area that contains indirect sunlight. This will keep the blooms from burning and will preserve the flower longer. Best practice would be to find a spot that is semi shady to semi sunny. These are one of the few orchids that will grow from the steamy tropics to the cool mountains to even habitats that are desert-like. Talk about a versatile plant! Majority of the Oncidium orchids will thrive with daytime temperatures between 70-85 F and 60s in the night time. Some species will do better with 50-55 F at night. The humidity of the Oncidium orchid should resemble that of its natural habitat. You want to keep the humidity around 55-75 percent. Insufficient humidity will cause the orchids health to deplete. If you need to mimic their humidity or add some humidity you can always place a tray that contains pebbles and water underneath it. Oncidium orchids require more water during their growing and blooming months. During the quiet months cut back on the watering. This is the orchid’s dormant season and too much water will cause root rot. 1) Psedobulbs should not be shriveled, they should be plumped. The psedobulbs are the orchid’s water storage. 2) The orchid’s compost should not be completely bone dry. The roots of an orchid loves the water the trick is to have enough drainage for the water. Giving the Oncidium orchid fertilizer you aid the orchids flowering and growth process. This does not mean that if you don't give the orchid fertilizer it will die. Trust me I have gone several months without however that isn't the best practice. Fertilizer provides the orchid with the different chemical elements to thrive. Please remember that just because you add fertilizer does not promise longer or an abundance of orchid blooms. Orchids will bloom when they are ready, so be patient! A fertilizer of 20-20-20 once a month should be sufficient throughout the entire year. Make sure you do not over fertilize the orchid. Over fertilizing orchids will cause permanent root damage to the orchid. Some orchid growers will fertilize more often but with a diluted amount. If you pick this way make sure you read the labels on the proper fertilizer to water ratio. Re-potting your orchids should be done every 2 years and with caution so that you do not damage the root system. The best time to re-pot the Oncidium orchid is after new growth has started. Do not re-pot during the orchids blooming session. 1) Pick a pot that contains holes at the bottom for proper water drainage. You also want to make sure the pot is large enough for the next 2-3 years of growth. These tropical plants like to be somewhat crowded so the next pot does not need to be to large. Just the next size up. I usually get a clay pot or clear pots. I like the clear pots especially, if I just split an orchid and I'm watching for their roots to grow. The other benefit of clear pots is that the sun can reach the roots. 2) When you re-pot your orchid you want to make sure you remove all of the old medium. I cut away some of the dead or soft roots (the dead ones will appear brown) to make room for new ones. When completing the removal of the roots you want to use clean shears as to not pass on any diseases from other plants. 3) Place the medium in the pot and around the new orchid. Make sure you do not pack the medium in the new pot. Air should be able to move freely through the medium. Clay pots usually contain more holes around the sides and underneath. The downfall is you may have to water more often. 4) Add a stake to stablize your orchid up and in place. This will also help the orchid not fall over and add more stress to it. You can never have to many plant stakes and clips! I have experienced several times where my stakes have broken and I haven't had extras around. I found these online and stocked up! I'll never be in that situation again. TIP: Some people will mount Ocidium orchids on a tree or piece of bark as to not have to repot the orchid. Mounting the orchid in this fashion may require you to water it often. Dividing Your Orchid... can only occur if you have enough pseudobulbs. 1) Each division of the tropical plant should include a minimal of 4 pseudobulbs. TIP: Make sure the 4 plants have healthy looking leaves. Healthy leaves will aid the orchid in future growth. 2) Inspect your orchid for a natural division line. This simple means that you want equal sizes of pseudobulbs for each division. 3) With a clean knife (always use a clean tool to prevent any spread of viruses among plants) cut down the division line. You will cut through the rhizomes and the root mass. TIP: When making your cut try and keep as much of the root mass as possible. This will help with the orchids transplant shock. 4) At this point you can now clean up any dead roots or leafless canes.